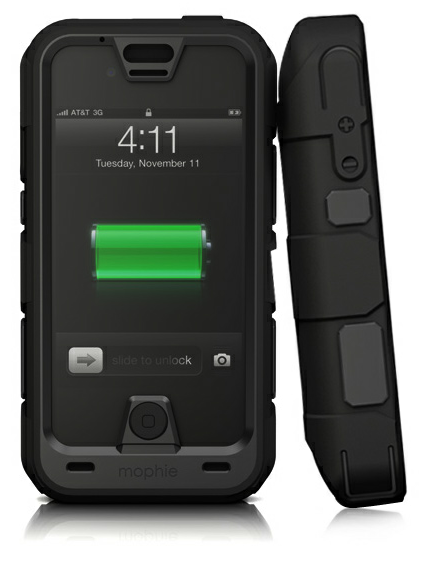 Mophie has announced a new battery case that will join its Juice Pack line of highly praised iPhone battery cases very soon. The Juice Pack Pro is the company's most rugged iPhone 4S and iPhone 4 battery case ever. It features an ultra-tough and rugged co-molded rubber and polycarbonate design that's impact resistant and offers superior drop protection that exceeds military specs along with water splashing and rain, sand and dust as well as vibration and shock protection. The Juice Pack Pro is said to have a very large battery capacity, though Mophie has yet to release the exact specs we're banking on a massive 3200mAh 2500mAh built-in rechargeable battery, a built-in screen shield, sealed ports and it'll also be accompanied with a belt clip. Mophie's Juice Pack Pro will most likely retail at around $130.